As summer turns to autumn and the colder weather creeps in, many people exploring ideas for their new kitchen design will turn towards an AGA. So why should you consider an AGA for your Kitchen? For one thing, they’re a fantastic way of warming the room. This is often the primary reason that people look towards an AGA at this time of year, but there’s much more to them than that. For starters, an AGA is a real classic of British design. Every AGA is built at their factory in Shropshire, and has been a mainstay of contemporary design for years. The AGA even came in third place on a BBC poll of top 20th century British design icons. Associated more often with contemporary style kitchens, Design Interiors can supply and fit an AGA in your new kitchen. Below is a stunning kitchen created by our designer Sharon. 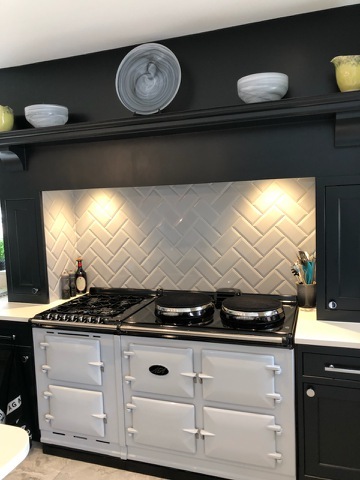 The kitchen in this property was a former bakery, and our clients wanted an AGA for use in the winter months, alongside conventional ovens for the summer months. As you can see, the design of this AGA suits the kitchen perfectly. Another reason to choose an AGA is longevity and reliability. Many people will replace electrical appliances on a roughly 10 year basis, but an AGA has a much longer life than this. We’ve talked to people who have had the same AGA for 40 or more years, and never had a single issue. As well as having a long life, every AGA is made of more than 95% recyclable material. If you want help incorporating an AGA into your dream kitchen, Design Interiors are here to help. We can supply and fit the complete AGA range, so get in touch and see what we can do for you.